The fresh flavour combination of natural yoghurt and cucumber is common to many cuisines, as a dip, a sauce, a soup and a palate cooler. Indian Raita, a thin sauce interpretation using undrained yoghurt flavoured with fresh mint, was introduced to the sub continent from the middle east by the invading Mughals in the 16th century. The Turkish version, Cacik is whisked with iced water flavoured with dried mint and served as a soup or served undiluted as a dip. 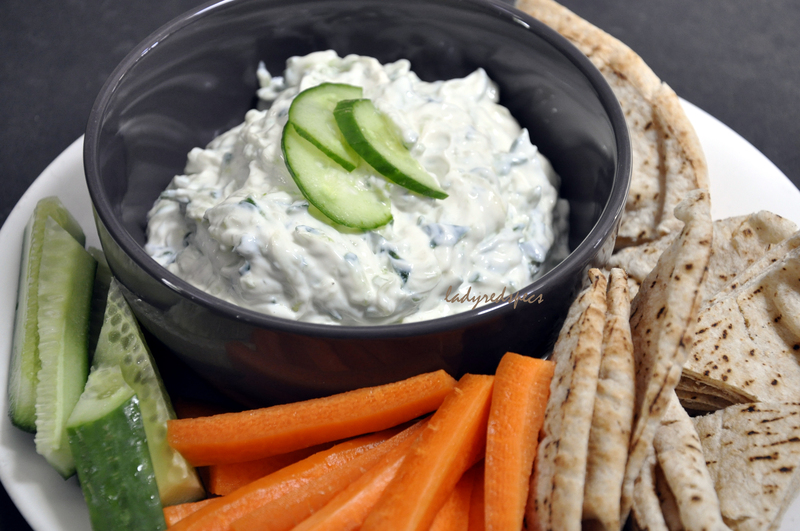 This is my version of the thick Greek dip, tzatziki. Plan ahead when you want to serve this home made tzatziki. Salting and draining the water from the cucumber and draining the whey from the yoghurt takes time but it ensures a thick dip that can be used to dollop on souvlaki, meatballs or rice, so it’s well worth the wait. Hands on preparation time is short. Tip the yoghurt into a fine mesh sieve or a colander lined with muslin. Stand it over a dish, put it into the fridge and allow the whey to drain off for a couple of hours or overnight. It will be quite thick. I had 180mls whey after 20 hours. Wash, then coarsely shred the cucumber with its skin on. Put the shredded cucumber into a colander and toss the salt through. Allow to drain for 30 minutes, then squeeze all the remaining moisture from the cucumber. I drained off 200mls of water. Grind the garlic to a paste with the extra salt, either using a mortar and pestle or the side of a cooks knife. Mix together the drained yoghurt, the shredded and drained cucumber and the garlic paste and pepper. Set aside for 1/2 hour so the garlic flavour permeates before serving. Uh I love tzatziki – with lots of garlic! Last time I had a real good one, was in Crete, they scooped a big spoonful in the gyros, heaven! The beauty of making your own tzatziki is you can vary the garlic to suit your taste! True 🙂 Its hard to get the ratio right, so thanks for the recipe!! This entry was posted on January 14, 2013 by ladyredspecs in FODMAP diet, Food, Gluten Free, Light Savoury Dishes, Side Dishes & Salads and tagged cucumber, garlic, gluten free, raita, tzatzilki. cacik, vegetarian, yoghurt.